The Sky-Watcher SK1141EQ1 is a 114mm diameter reflector telescope. It comes with two eyepieces for low and high magnification. 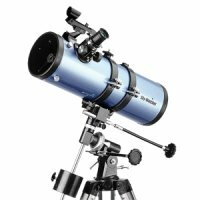 For superior stability, it is equiped with an equatorial mount, capable of tracking objects across the sky either manually or with optional motor. Sky-Watcher 20mm Long Eye Relief (LET) eyepiece.